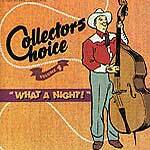 “Collector’s Choice” a perfect name for this great and exciting serie launched by El Toro Records from Spain. It gathers a majority of unknown and rare recording from the 50’s that were until now only available on scarce 45’s and 78’s. Volume 1 focuses on the Lone Star state artists. Home of musical legends, it was also full of lesser known but talented guys. The result is a 20 songs compilation filled with Hillbilly Bop (Ken Marvin, Alden Holloway, Stoney Calhoun), Hank Williams’ brand of country tunes( Jack Cardwell, Fred Crawford, Sammie Lee and Perry Washburn), talking blues (Leon Tassin’s Get A Move On Baby) proto rockabilly (Johnny Maxwell, King Sterling, Lucky Hill and Jimmmie Walton, both very close to Charlie Feathers’ vocal on tunes like Peepin’ Eyes), straight hillbilly (Jacoby Brothers), rock’n’roll (Hub Sutter’s Gone Golsing produced by Sonny Fisher). It comes with a 8 page booklet full of info including pictures of the original labels. Volume 2 is equally good, the sole difference is that this time you find artist from the whole States. Though names like Gene O’Quinn, Terry Fell, Leonard Sipes/Tommy Collins and T Texas Tyler may be familiar you still have plenty of obscure and rare stuff. So if you’re ready for good dose of uptempo hillbilly with raw steel guitar and fiddles, don’t look no further. Like the previous one you can hear the influences of “big names” on local artists: Hank Williams is almost everywhere but also Ernest Tubb (just listen to Jimmie Collie) and Elvis Presley (Al Runyon’s cover of My Baby Left Me). It’s also fine to hear some ladies on this selection wether it’s solo (Betty Coral) or duet (Joyce Lawrence and Earney Vandagriff). Volume 2 comes with a 12 page booklet. Buy both, you won’t regret it, believe me. The third and fourth volume of this excellent serie gather stuff from the collection of Dave Penny. Like volume one and two, the material compiled is mostly rare and comes from obscure artists though the names of Ernie Chaffin, Lonzo and Oscar, Gatemouth Brown and Jean Chapel are surely familiar to our readers. But once again this is lesser known recordings that appear here. “Firecracker Stomp” focuses on the hillbilly side of things. It kicks off with a Arthur “Guitar Boogie” Smith kind of instrumental from Jimmie Lane. The rest of the selection is made of classic honky tonk, country duets (I’m Your Man by Myrna Lorrie and Buddy De Val will make the pleasure of Ginny Wright/Tom Tall fans), hillbilly comedy act (Lonzo & Oscar), muscled hillbily that just demands to mutate into rockabilly (I’m Movin’ On), hillbilly bop (Pete Lane)… The influence of Hank Williams van be vividly heard on Bobby Roberts’ I’m Gonna Comb You Outta My Hair and Eddy Star Love Me, Love Me. Also included is Carolyn Bradshaw, who’s in addition of being talented, shows that Chess record actually release some country flavored tunes too. Another of my fave here is Jimmy Dean’s rockin’ hillbilly blues version of Freight Train Blues. This song is sure to appeal fans of Ray Condo and His Hardrock Goners. The closer is a great cowboy jazz instrumental from the Rhythm Rockers, actually Nashville session musicians led by Chet Atkins. “What A Night” is about Rock’n’roll under its different forms: instros (the strange “Ponytail” and the jazz blues of Gatemouth Brown), Rockabilly (Ernie Chaffin with a non Sun single not available on the Bear cd), Hillbilly Boogie (Eskimo Rock), Blues and Rhythm’n’Blues. Both records come with detailed liner notes and photos. The new volume of this collection is entirely devoted to Boogie Woogie. It seems that, at one time, everybody and his cousins recorded boogie woogie following the path of Tennessee Ernie Ford (whom 2 covers are included here). Maybe 20 country boogie in a row would sound too much but the selection is well done and avoids as possible repetitions. Okay it follows more or less the same pattern but the instrumentations are varied (steel, guitar, fiddle, accordion, piano you name it…) as well as the tempos. It goes from the raw sound of George Davis the Singing Miner to the more polished arrangement ala Spade Cooley of Jim Boyd, brother of western swing bandleader Bill Boyd and one time member of Roy Newman’s band and he Light Crust Doughboys. A good overview of a major subgenre of hillbilly music, that comes with an informative booklet. The 6th volume of this serie is a collection of top hits cut by obscure artist for budget label. The evidence forces to say that most, if not all, suffer from the comparison with the original (in a way it sounds suicidal to cover Hank Williams) but some deliver a certain charm that belongs to weird and even amateurish things (like B-movies if you want). Others are terrible failure but none the less fascinating (the musical equivalent to Ed Wood if you want to stick with the movie metaphor). Hank Smith (aka Leon Payne) plays Blue Suede Shoes with a rather unrehearsed band that doesn’t seem to know where the breaks are, Bob Sandy has a very personnal conception of tempo, too bad his band doesn’t share his view and My Baby Left Me by Rusty Howard is totally insane (but would almost make the Legendary Stardust Cowboy jealous). It may not be the best of the serie in term of musicianship but it’s probably one of the most interesting. Share the post "Collector’s Choice"